Alessandro Masnaghetti and I arrived at Pickberry Vineyard to find an array of bottles laid out on Cris and Lorna Strotz’s kitchen counter. Over the years, the Strotzes have sold fruit from their Sonoma Mountain property to a number of wineries. It may seem hard to believe, but Alessandro and I rarely taste when we are working on maps because we are so focused on the task at hand. But it was the end of the day, and we were tired of battling with the unrelentingly cold, rainy weather, so we decided to take a little break. One label in particular caught my eye, the 1986 Ravenswood Pickberry Vineyard. Joel Peterson’s Ravenswood wines have a track record of aging brilliantly, so I was intrigued to check in on this 30+ year-old Cabernet Sauvignon/Cabernet Franc-based blend. 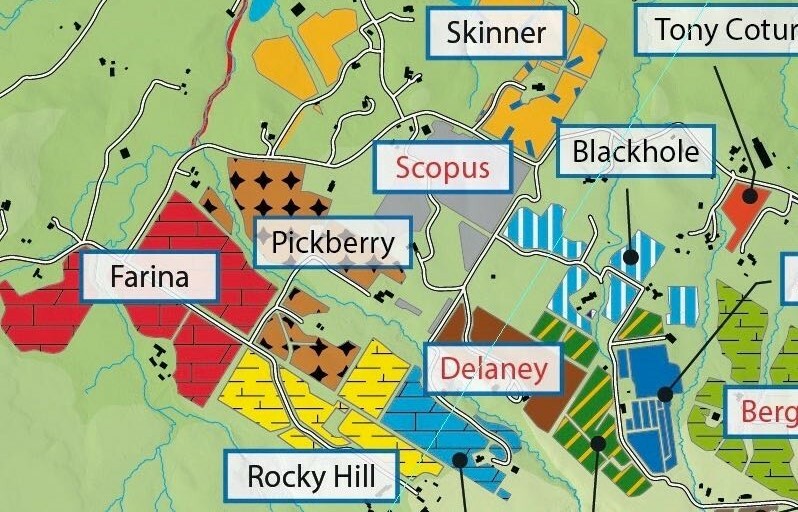 A view of Pickberry and surrounding vineyards, as seen in the forthcoming The Vinous Map of the Vineyards of Sonoma Valley by Antonio Galloni and Alessandro Masnaghetti, scheduled for release in late 2019. The 1986 Pickberry Vineyard is utterly captivating from the very first taste. Remarkably deep, especially for a wine of its age, the 1986 is simply magnificent. A whole range of cedar, smoke, tobacco and black olive notes race across the palate. Powerful, resonant and structured, the 1986 is at a glorious peak of expression today. Even with quite a bit of time in the glass, the 1986 remains incredibly rich and deep, which is remarkable given that these vines were just four years old at the time! Joel Peterson opted for an unusual blend of 50% Cabernet Sauvignon, 40% Cabernet Franc and 10% Merlot. The Franc really seems to add an element of spice that is unusual in Sonoma Bordeaux blends. More than anything else though, the 1986 Pickberry Vineyard is a wine of pure and total sensory pleasure that shows just how pedigreed Sonoma’s best sites are. Readers lucky enough to own it can look forward to another decade of exceptional drinking. 95/2019-2029.